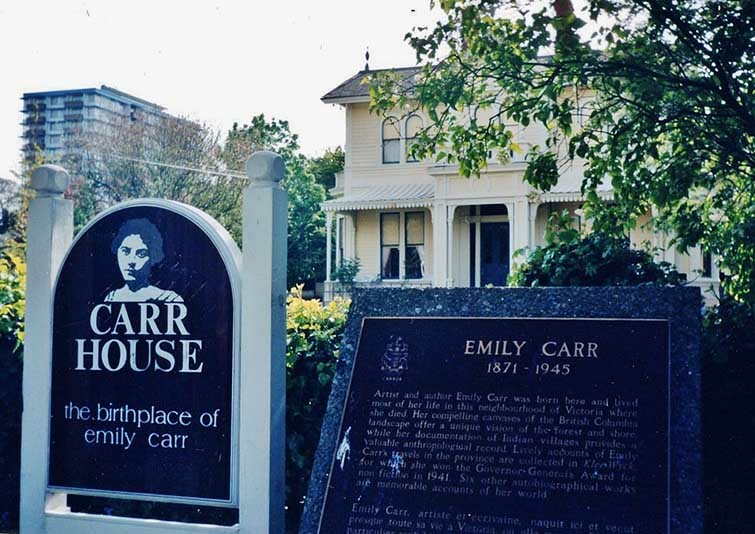 Emily Carr House - Historical Places of Victoria, B.C. The Emily Carr House is the childhood home of Emily Carr, a world-famous Canadian artist and writer, who received high praise and global recognition for her works. She was born in December of 1871 – the eighth of nine children – and passed away in March of 1945. 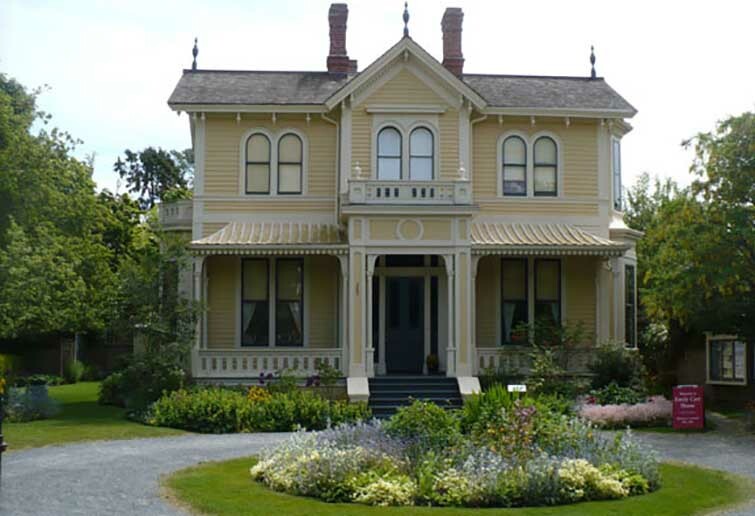 The quaint home is located in Victoria, B.C. on Vancouver Island and is recognized as a Provincial and National Historic Site of Canada. Emily Carr’s best-known works were her writings and paintings, many of which depicted the lives of the First Nations people of Canada. The most famous of her writing was her book Klee Wyck, which tells the story of the lives of the First Nations people. Klee Wyck later won her the Governor General’s Gold Medal for Literature. Some of her other published books include: The House of All Sorts, the Book of Small, Hundreds and Thousands, Growing Paris, the Heart of the Peacock, Wild Flowers and Unsettling Encounters. Emily Carr was most recognized for her impressionist paintings. Her most famous works include: The Big Raven, Guyasdoms d’Sonoqua, Indian Church, Totem Walk at Sitka, Zunoqua of the Cat Village, Red Cedar, the Mountain, Tree Trunk and the Rushing Sea of Undergrowth. Today, the Emily Carr House is an interpretive centre providing insight into the life and art works of the famous Canadian artist. Tucked into a beautiful yard, the charming yellow house entices you to wander with your daydreams and take your time to enjoy the site. Fittingly, the house is located on Government Street in an enchanting area that used to be known as Birdcage Walk, thanks to its proximity to the “Birdcages” of the B.C. Legislative Assembly. The home’s wonderful gardens, impeccably kept, make it easy to picture Emily and her eight siblings enjoying the summer sun and beautiful nature. The house itself welcomes you to curl up in a chair with one of her works and truly immerse yourself in the life of the talented artist. Rooms are filled with Victorian-era furnishings, bringing you back to the days when Emily was a young girl growing up. As homage to a woman who greatly enjoyed the company of furry friends, you may even run into a few of the Carr-House Cats! Emily Carr herself was known for her pet monkey, Woo. Breaking the boundaries of her conservative upbringing, Carr was one of the first painters in the country to adopt her unique, modernist and post-impressionist painting styles, focusing deeply on Aboriginal themes and capturing the beauty of British Columbia’s coastal rainforests. The Emily Carr House often plays host to different art showings, events and exhibitions, and is a popular attraction in the area. In fact, thanks to its heavy involvement, the House is a true cornerstone in Victoria’s artist community. There is a gift shop on site with many of Emily Carr’s books and reproductive prints available for purchase. Please note that the Emily Carr House is only open to visitors from May to September, so if you’re visiting later in the year, you will not be able to see the exhibitions!